In 2012, I went to Directors Lab West, an 8-day intensive for directors in Pasadena, California. I took a week off from my office job to go, and saved money on the trip by sharing a hotel room with another director. I didn’t really know what to expect, but I took a leap of faith that it would be interesting and useful. I wrote about each day of the Lab in a series of blog posts. You can read those here if you like – but in short, being in that intensive environment crystalised something for me about the artist and person I wanted to be. I finished up the projects I was working on in San Francisco, and I moved to London in July 2013. At the time, I was starting to figure out that I wanted to make a kind of theatre that I wasn’t seeing on stage locally. I did some research into getting an MA in devised theatre – but the price of the programmes, and the idea of disappearing into academia for a year or two, has dissuaded me for now. I took some one-off masterclasses with artists who were making the kind of work I was interested in. I talked to people. I read books. I saw shows, I saw shows, I saw shows. Four years after moving to London, I’m still looking for a rocket ship of inspiration and possibility like the one I was riding after Directors Lab West. So I’ve created the programme I want to see: the London Devised Theatre Intensive. In October this year, brilliant guest artists Bryony Kimmings, Kristine Landon-Smith, Tom Mansfield, Nir Paldi, and Lee Simpson will teach masterclasses in their favourite devising techniques. 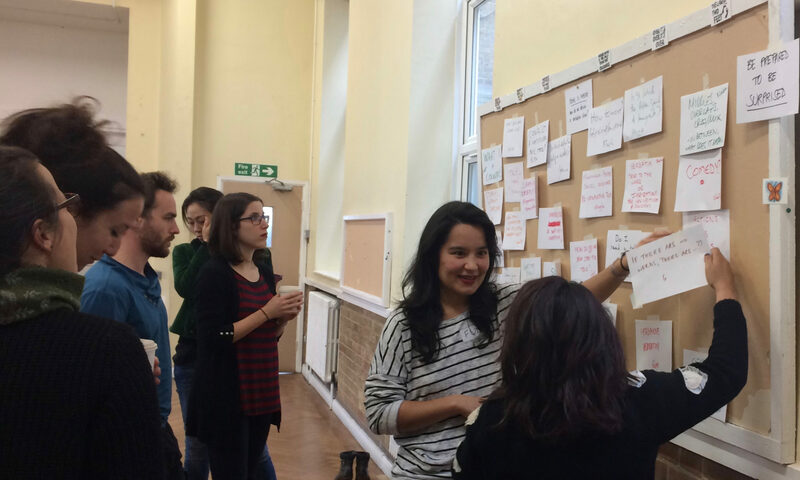 Theatre makers attending the workshop will lead peer practice exchange sessions to share how they work. Every day, we will put those new methods to use by making performances together. By the end of the two-week programme, each attending artist will have learned 5 new techniques from master artists and 8 new techniques from their peers, been inspired by 3 professional devised theatre productions, and created their own devised performance. As well as the creative work, there’s a strong professional development side to the Intensive. Laura Lundy, executive director of our partner Blue Panther Productions (San Francisco & international), will coach artists on how to ‘get visible and get produced.’ We’ll celebrate the end of the Intensive with a New Work Happy Hour, where our theatre makers will get the chance to chat with artistic directors and producers about their work. I wish I could participate in the Devised Theatre Intensive myself! But I am so excited to facilitate this programme for a room full of fellow theatre makers. It will certainly be interesting and useful. It will launch a rocket of inspiration and possibility for everyone who attends. Will it change your life? I’m fully expecting it to change mine. Details of the programme and how to apply are at www.devisedtheatre.com. Limited places; apply by 30 June 2017.